I’ve lived in the capital region since 1997. Even though I grew up just a little south of here, I had never heard of fish fry until I moved up here for college. Then, my buddy, Brian G., used to order fish fry on Fridays during lent when we got together at the Rathskeller of Siena College for lunch. Our friend Rory and I used to make fun of him because we couldn’t figure out why anyone would want a skinny piece of fried fish on a hot dog bun. Unbeknownst to me, fish fry was a legendary regional institution, and, once I got to driving around, I saw that there were literally dozens of restaurants around here that specialize in fish fry. I’m exaggerating a little, but you could throw a rock and hit a fish fry restaurant. Not only that, it’s also a staple on the menu at restaurants that specialize in other stuff. Ted’s is the big “chain” of the area. I visited a Ted’s a couple of years back and wasn’t wowed, but I thought setting a milestone event for the blog, the 3 year anniversary, at this legendary institution where I’d try the special of the region would be a lot of fun. We met at the Lansingburgh (North Troy) shop this past Saturday, and I actually tried the fish fry. But let’s talk a little about the experience first. I arrived a little early for my get together so that I could circulate when friends got there. I figured nobody wanted to watch me eat. 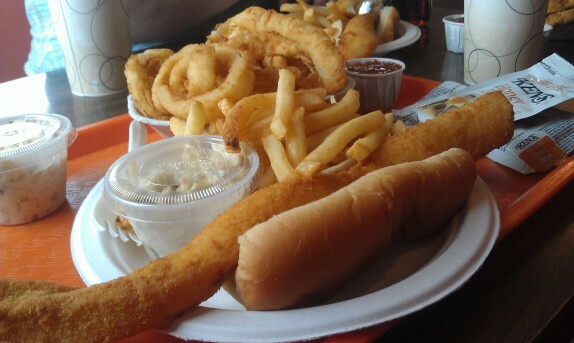 Cassie and I each ordered the fish fry special ($8.99 – includes fries, cole slaw, and a drink). For good measure, I also ordered chicken tenders ($7) and onion rings ($3). You know, just in case the fish fry was a total dud. The whole bill came to a little under $30. I thought the onion rings were actually pretty damn amazing. They blew away the rings from my trip to the Wolf Road location. They were aggressively seasoned but not to a detriment. 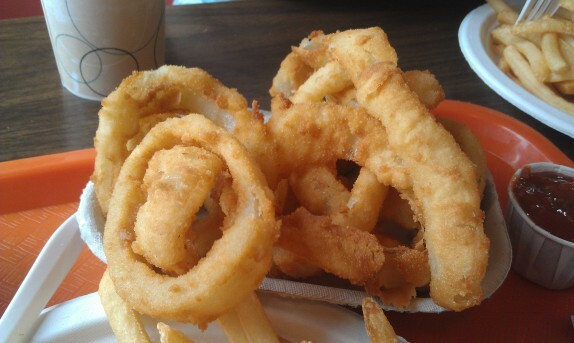 I had some honey mustard dressing sitting around from the chicken tenders, and it was great for dipping the rings too. I don’t have a whole lot to say about the chicken tenders aside from the fact that they were a little dry. They were tasty, though. I can deal with a dry fried chicken tender if it tastes good. I really liked the cole slaw, but it tasted a little familiar. Back to the fish fry. I’ve abstained from reading a lot of what people have had to say about fish fry. Because of a number of scarring experiences as a child, I’ve avoided ordering fish for a long time. To me, knowing who makes the best fish fry is like knowing what the best Skid Row album is. I’m sure it’s important to somebody, but since it’s not my thing anyway, I have no business caring where the best one is; it’s never on the top of the list of things I’d order. Still, I gave it a fair shake at Ted’s this time. 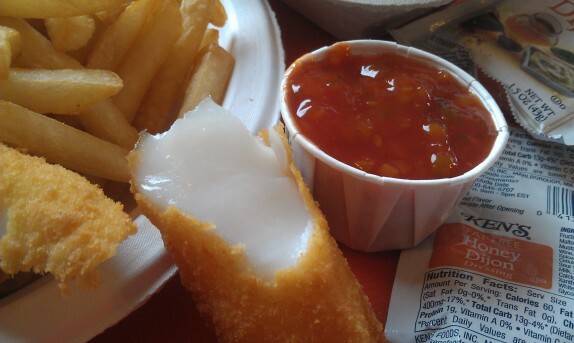 According to the young man at this particular Ted’s, they use cod. It’s a piece about twice the length of a standard hot dog bun that’s lightly breaded and lightly fried. 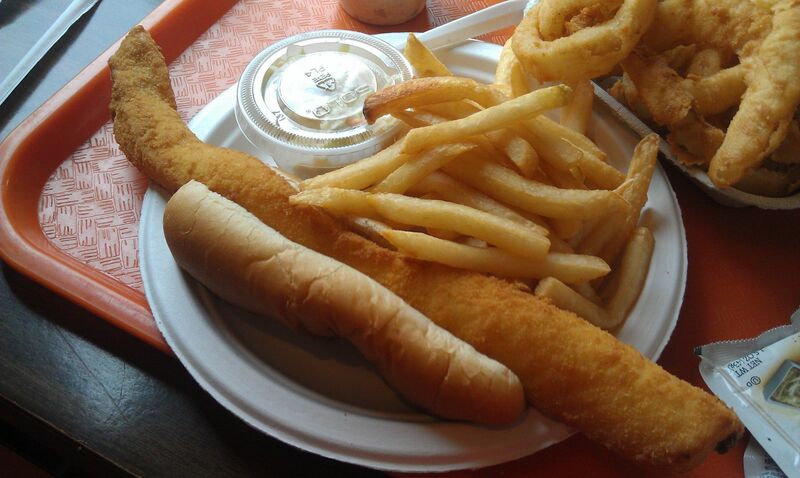 The breading has a good balance of flavor that doesn’t really penetrate the fish. 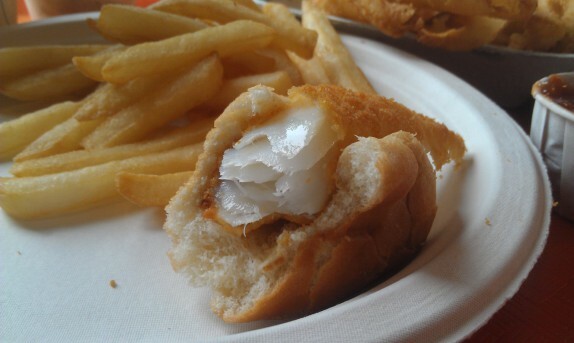 Since the duration of the fry is relatively short, the fish stays tender and flaky throughout. 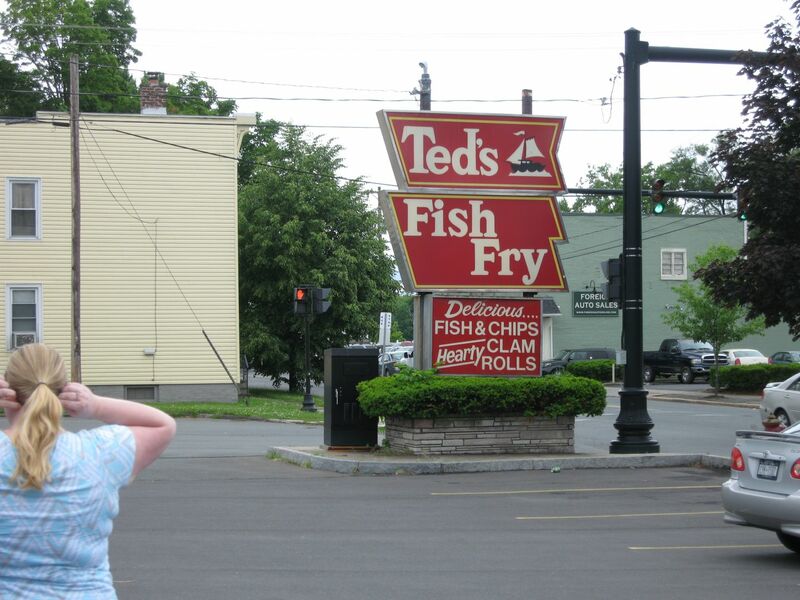 Ted’s serves fish fry with either tartar sauce or chili sauce, and you can opt for the sauce on the side. I went for the chili sauce on the side; it reminded me of the zingy mix of ketchup and relish. The natural thing to do is flake off and eat the ends of the fish without bun so that you can eat the rest as a sandwich. I wasn’t actually keen of the fish on its own. Dipping in the chili sauce helped but marginally. When I got to the bun, it was like a whole different experience. 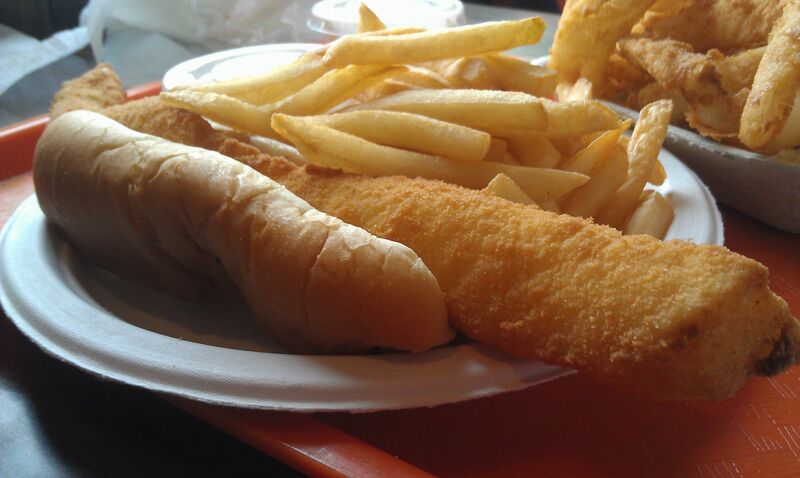 The bread actually adds some soft texture and subtle sweetness that I think this particular fish and breading needs. I slathered the chili sauce across the fish and bun and also dipped it as I ate it. And it was decent. I can’t say that I loved every bite, but I can appreciate why people love it. Ted’s definitely provided a fun venue to share lunch together. And we had a good time! One thing a few of us noticed were the garbage pails. Not one, not two, but all three of the pails were missing a word in their instructions. 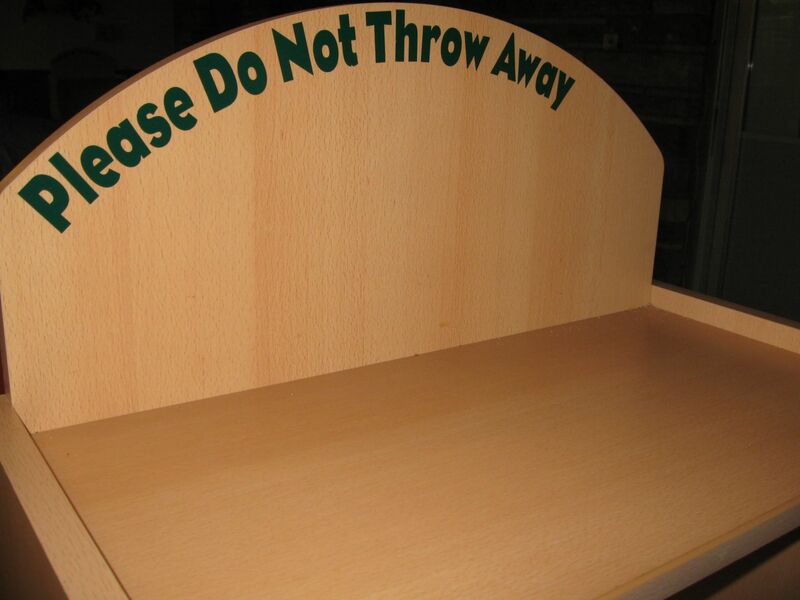 It’s not like were were offended or anything, but it’s little touches like this that give places their character. And it was good for a laugh. The fish, mind you, is fantastic. It’s moist and flaky with a great crust. No, the crust isn’t greaseless. It’s actually a bit greasier than most. And no, it’s not quite as crunchy as the cornmeal crust at Off Shore Pier across the way. It also could benefit from a bit of salt that is also available at the condiment station. 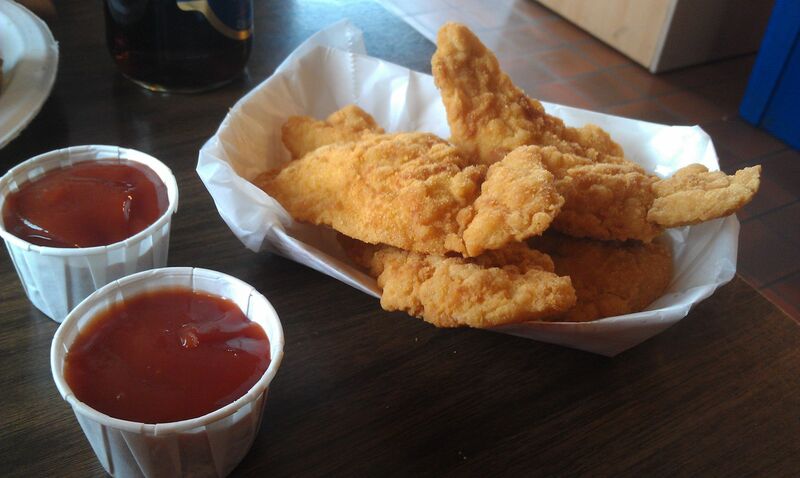 But with unique takes on the classic sauces, well cooked fish, and a solid crust, Gene’s is my clear favorite fish fry in the region. Best fried fish sandwich (whiting) I ever ate was at a festival here in Northern North Carolina…it was a huge filet, had great slaw on it and served on plain white bread with tartar sauce with a little hot sauce, the crust was an Autrey’s Seafood Breading…it was part of a fund raiser for a black church in Roxboro, NC.